I'm not promising a super exciting adventure. But you're welcome to join me if you'd like. Mostly I read and write. And lately, I run. And bike. And swim. And every once and while you might find me doing something fun. I'm really trying to make an effort to catch up on race reports for 2015 by the time the year ends. That's two more months. I can do it. 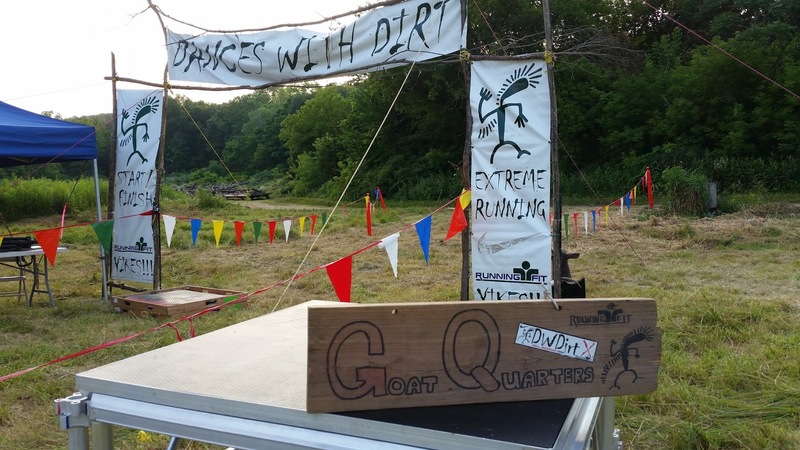 So last time I blogged, I told you about running--err, trudging--up a bluff for some fantastic views at Dances with Dirt. August brought the Madison Mini. I love this race. I missed doing it in 2014 because I hadn't completely recovered from the car accident, so I was excited to run it this year. And play hostess to three good friends. The race itself was a struggle. From the get-go. Like 3 miles in I just wanted to quit. But I kept putting one foot in front of the other. Covered some miles. Got a popsicle from a little kid around Mile 10. Cursed the slight course change over the final miles that made me run up the back of Bascom Hill. Longed for the final miles on the Lakeshore Path that were missing this year. 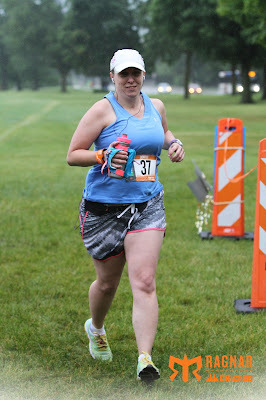 And had a smile on my face when I crossed the finish line. Most of my struggles were mental. I put in some decent training this summer, got some long runs in the 9 and 10 mile range in. Just mentally didn't have it. I need to work on that. But the race got run, we enjoyed the post-race party on the terrace and had a fabulous weekend with friends. Looking forward to the 2016 version! This was the hardest thing I've ever done. I don't remember what I was thinking when I signed up for this race. Oh wait. A weekend with friends. Some running. A beautiful setting. It would be fun. 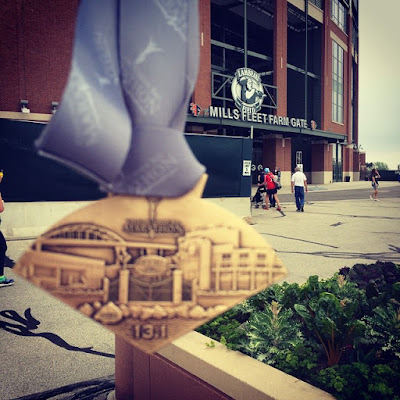 Even though I had heard about how brutal this course was during the first four miles, I didn't think twice when I hit the "submit" button on my registration. But it was. Brutal. And in a sadistic way, pretty fun. 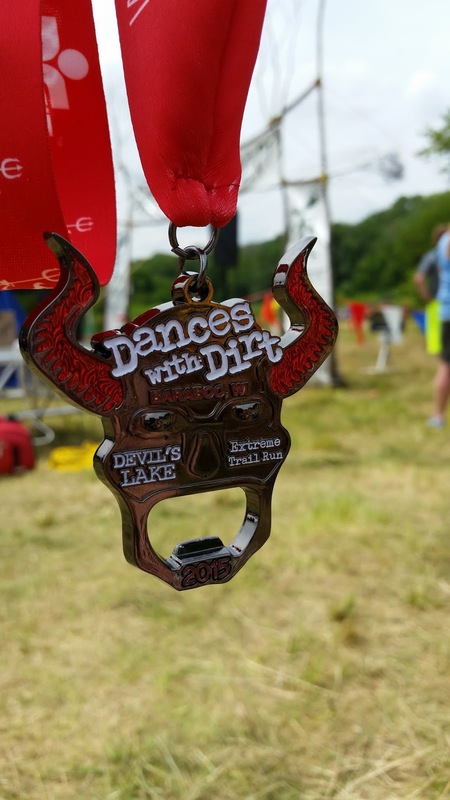 The weekend started with the drive up to Devil's Head ski resort, where the race started. You can't really argue with a road trip that involve a ferry ride. 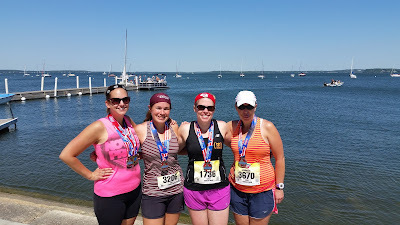 I ran with four other friends for the first 5 miles or so. Actually, I'm not sure "ran" is an appropriate word. Especially since the first two miles consists of something crazy like 800 feet of elevation gain. Yeah. There's no running on stuff like that. More like a slow trudge while hoping there's a branch you can grab on to to pull yourself up. Our little group split into two groups somewhere around mile 5. Surprisingly this was a fairly flat section of the course. Ha. It was just lulling you into a comfort zone before you turned a corner and were faced with another steep uphill climb. This was like 200 feet of elevation gain in just a half mile. Crazy. But once you got to the top of the bluff. The view. It made all those hills worth it. Yes, I may have just wanted to sit down on the bluff and hang out there the rest of the day, but I had to keep running. 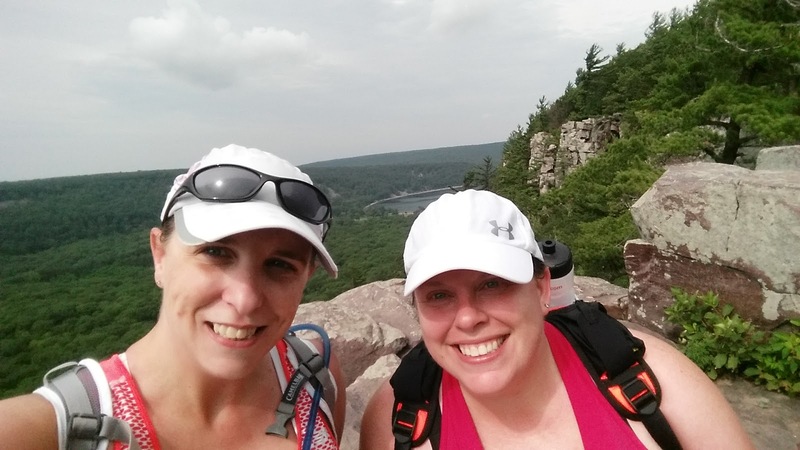 I stuck with my friend Erica until Mile 10 and then headed off on my own for the final three miles. That massive two-mile long uphill at the beginning? Well, I got to run down it. It was a little scary at times, but kind of fun to run downhill while avoiding the rocks. 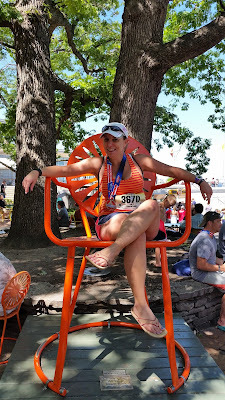 Of course, since my banged up knee from Ragnar was finally starting to heal (in other words, no scabs and I could bend it with screaming in pain), I was a little cautious. Didn't want more of that. So I finished. Eventually. There was a lot of walking. Some running. But overall it was a fun trail race, even if it was the hardest thing I've ever done. Started a new job on Monday. Looking back, I'm not sure I'd recommend anyone else do that. You kind of forget what city you're in. But I couldn't pass up Ragnar Chicago. I mean, I didn't want to let my teammates down. And besides, it's one of the most fun weekends of the year. I was runner 2 this year. 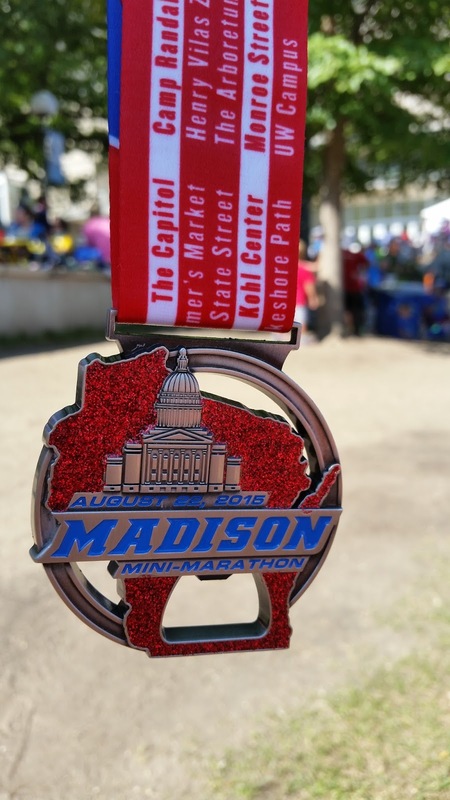 New to me legs and the first time I actually got to run in the city of Madison! We woke up Friday morning and it wasn't raining. 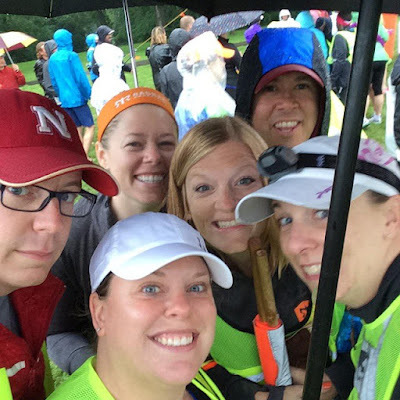 By the time we got to the start line and had to check-in, the rain was coming down pretty steady. Great. It's still raining. I opt for no jacket or anything. Just my shorts and tank. Hey, if I'm going to get wet, I'm going to get wet. Renee comes in the chute, I get the slap bracelet and I'm off. I got less than 100 yards and get to a crosswalk staffed with volunteers and controlled with traffic lights. The volunteer waves me through. The light says "walk" so I start to run through the intersection. And a stupid woman decides I don't deserve the right-of-way and decides to turn right in front of me. Almost hits me. What is it with me and drivers who refuse to wait an extra 10 seconds? Luckily I saw her, otherwise I would have been hit. Rattled, I continued through the intersection. I get to the other side and promptly get attacked by a sidewalk. Face planted. Stunned, I sit up. Check my palms (not bleeding), gather my stuff and stand up. I check my Garmin (yes, yes I did). I'm one-tenth of a mile into my 2015 Ragnar Chicago and I've already almost been hit by a car and took a digger on the sidewalk. Great. My teammates aren't around, so I did the only thing I could. I started to run. 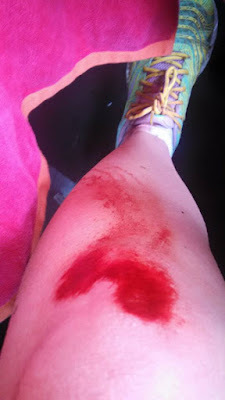 My knee, which took the brunt of the damage from the sidewalk, is bleeding. The blood is running down my leg (some guy filling up his gas tank yelled at me that my knee "didn't look too good." Really? I didn't know. ), and it's a little sore. But really, what could I do? I didn't have my phone with me. 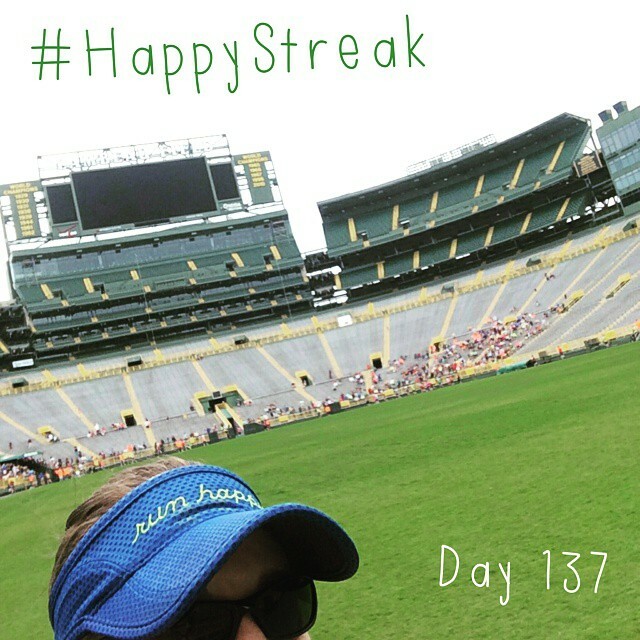 I eventually make it to the exchange zone, run up to Erica to pass off the slap bracelet and am met with, "Yay, Jen! What did you do?" I met up with the rest of my team, explain what happened and do a quick clean up with the limited first aid kit that we have in the van. 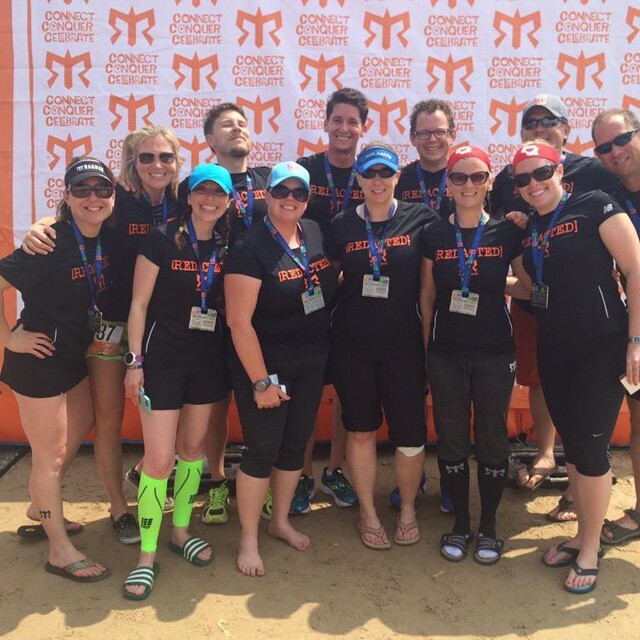 Once I get to the first major exchange at Lake Mills High School, I seek out some actual medical attention from the first aid tent, where they patched up my knee and elbow pretty good (it stayed on through the rest of Ragnar). I tried to keep the knee pretty loose during the day. Thankfully getting in and out of the van to cheer on runners helped. So it wasn't as stiff as I thought it would be for this leg. The run itself went pretty well. The rain finally quit (right after I finished my first leg), and the temperatures were perfect for a late June afternoon. This leg was mostly on the Glacial Drumlin Trail and just had a little bit of city sidewalks when I got into Waukesha. I was very, very careful on the sidewalks. I didn't want to get into anymore fights with them. I started this leg at 3:30 a.m. It's pretty dark at 3:30 a.m. And it was kind of foggy and SUPER humid. I've never actually had a Ragnar leg in the actual middle of the night before, so this was a first. 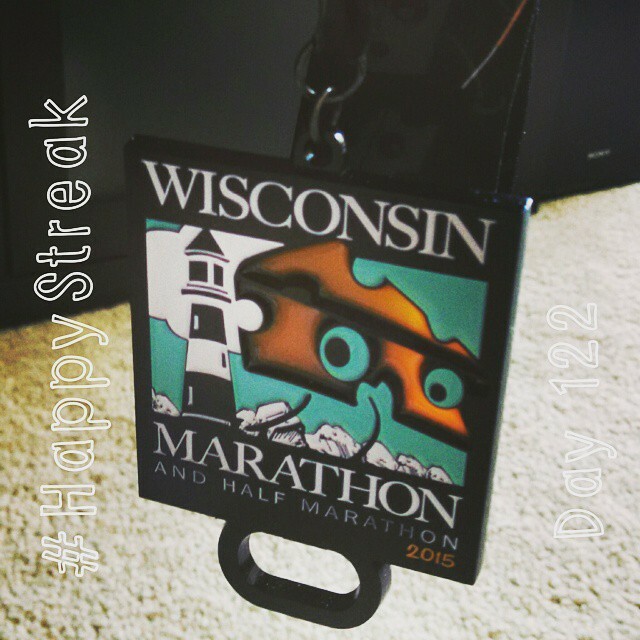 I left from a school in the Racine area and the first 3 miles or so of my leg was along a recreational path. Bordered on both sides by woods. So I'm running in the dark along a path with heavy trees and it seems like my headlamp is on the verge of dying. Of course I'm thinking animals are going to come out and attack me. So I try to run faster. And since this is my final leg and my bloody, wrapped knee is finally starting to get stiff, my legs decide somewhere around Mile 3.5 that they're done. No more. Thankfully I'm off the wooded trail and back on city sidewalks (again, watching them carefully!). So I do the run-walk thing. I make a turn and pass the "Welcome to Carthage College" sign in Kenosha at Mile 5 and I see three fat rain drops. Which immediately turn into a torrential downpour. Really? More rain? And not just a nice, soothing light rain. A cold, downpour. Well, I'm going to get wet anyway, so who cares if I walk some, right? Only 1.3 more miles to go. 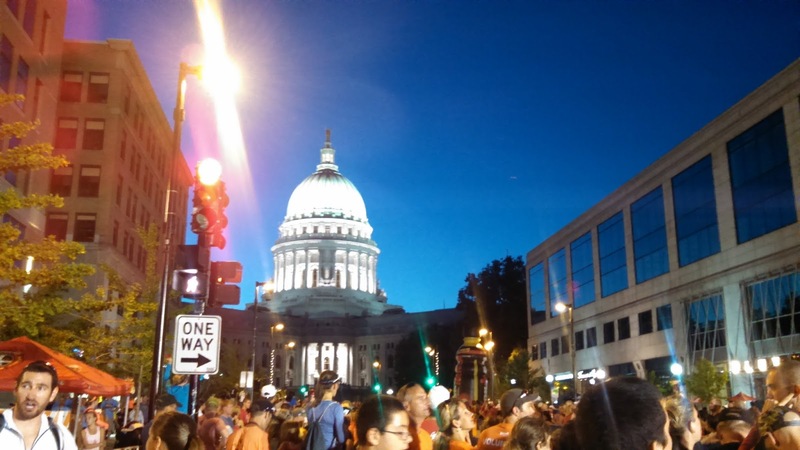 If anything, that cold rain definitely wakes you up at 5 a.m. when you're working on 2 hours of Ragnar sleep. I finally hand off the slap bracelet, get back into the van and set about trying to find some dry clothes. Oh, and it was the downpour that finally was too much for my bandaged knee. 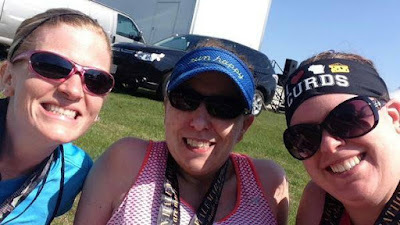 At the next major exchange (before we headed off to our post-Ragnar breakfast feast), I had another stop at a medical tent for some re-bandaging. 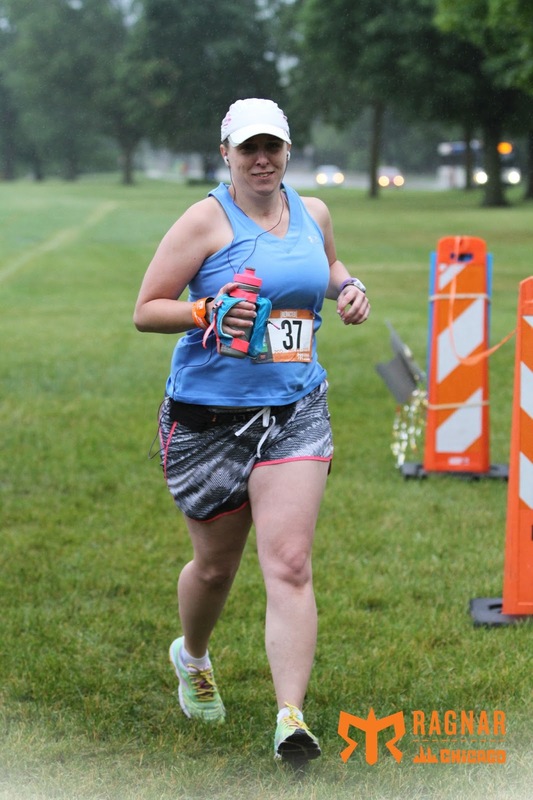 Aside from the sidewalk attacking me a tenth-of-a-mile into my Ragnar and having two of my three legs run in the rain, it was a great Ragnar. Can't wait for 2016. Because even though my life was undergoing some major changes, I still had races on my calendar for the summer. I ran them, although not particularly well, but I ran them and had fun. So first up was the Wisconsin Marathon in Kenosha on May 2, I headed down to Milwaukee Friday night to crash at my friend Erica's place. I remember having problems deciding what to wear - short sleeves? Tank? Tank and arm warmers? I went with the tank and arm warmers, shed the warmers by Mile 2 and tossed them to a friend at Mile 5. I don't remember much about the race itself. I ran with Erica for the first 4 or 5 miles and then we split apart. 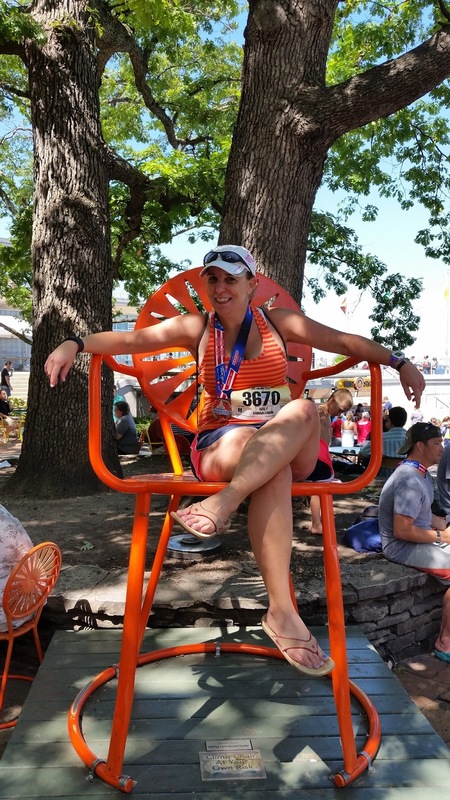 I always had her in sight thought, which was good, since I finally caught back up with her around Mile 9. We both looked at each other, realized both of us had stopped sweating miles ago and we just decided to shut it down and walk it in. It had gotten REALLY warm during the first 9 miles of the race. Like sunshine, not a cloud in the sky and warm temperatures. And water stops were really far apart. So we pulled out the "run to the stop sign" and then walk method. It was a nice course and well organized event. I just wasn't ready for the heat in early May. And I may have been a tiny bit undertrained. 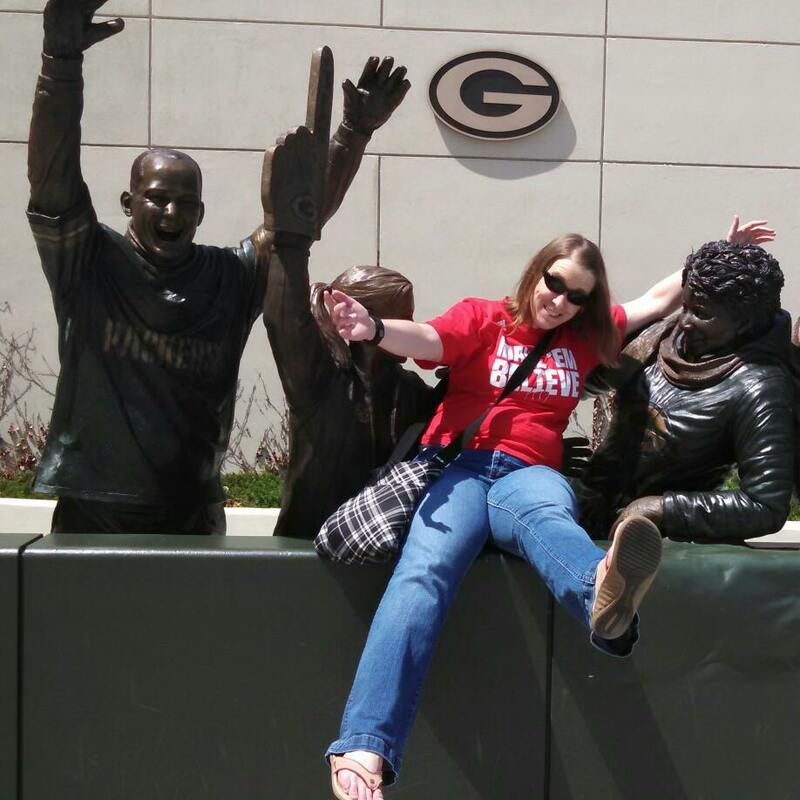 Oh Green Bay. I missed you in 2014. Stupid teenage girl who couldn't wait 10 more seconds at a stop sign. 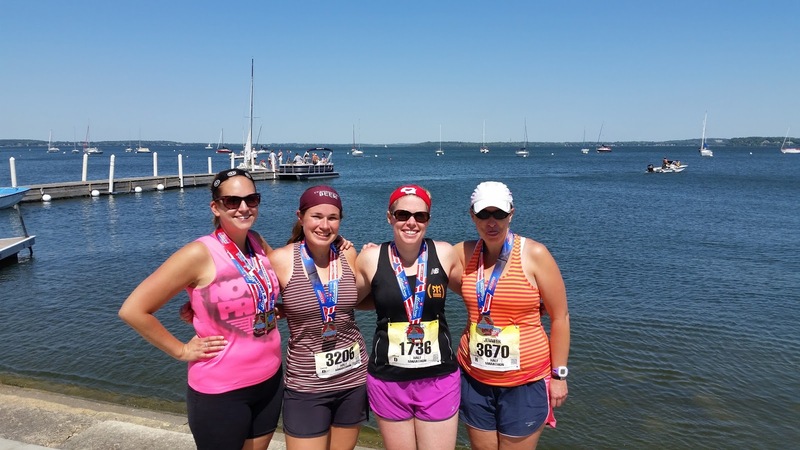 Another half marathon, another race where weather was troublesome. The first 5 miles were brutal. No wind. Sunshine. No clouds and warm. A struggle-fest from the get go. Thankfully some clouds appeared and the wind kicked in for the second half. They got rid of the industrial park this year. Yay! Otherwise, I finished. That's all. That takes care of May. It's been four months and my world has changed pretty significantly in that time. It all started because I was offered a new job. Gone were my days of working in a newspaper newsroom. I'm still writing. Still editing. Still working with words. But it's in a new environment. There are new challenges. New co-workers. New topics. But a little over two months in and I like it. A lot. Pretty sure I made the right decision career-wise. But the new job means a new city. So I packed up my Oshkosh apartment and headed south at the beginning of June. To Madison. A city I've always loved and was super excited to move back to. 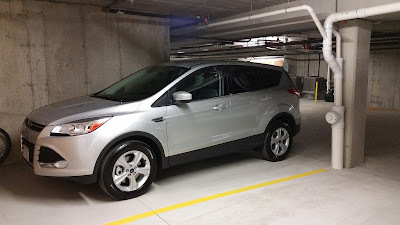 And of course, because a new job and new city weren't enough, my car died. So I've got a new set of wheels too. I don't think there are any more major life changes that I can pack into a month. Well, a friend did mention I could add in a boy to the equation. We'll see what happens there. I've found time to explore my new home on foot and by bike and am looking forward to more adventures. 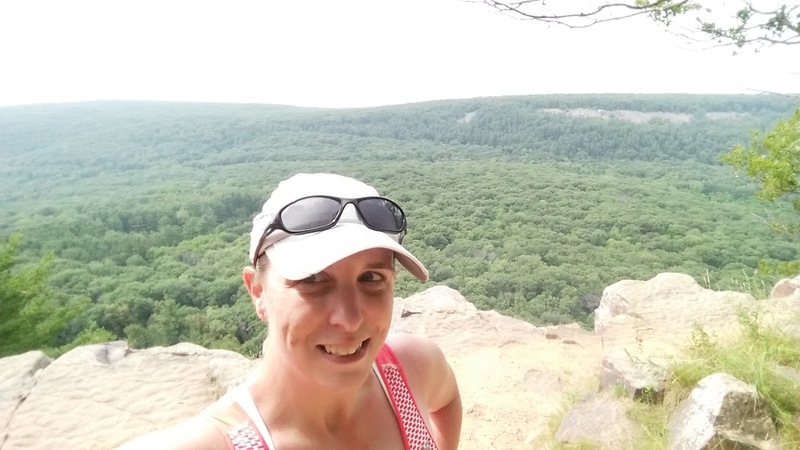 And then there were the running adventures that were already on the calendar before all these changes took place. 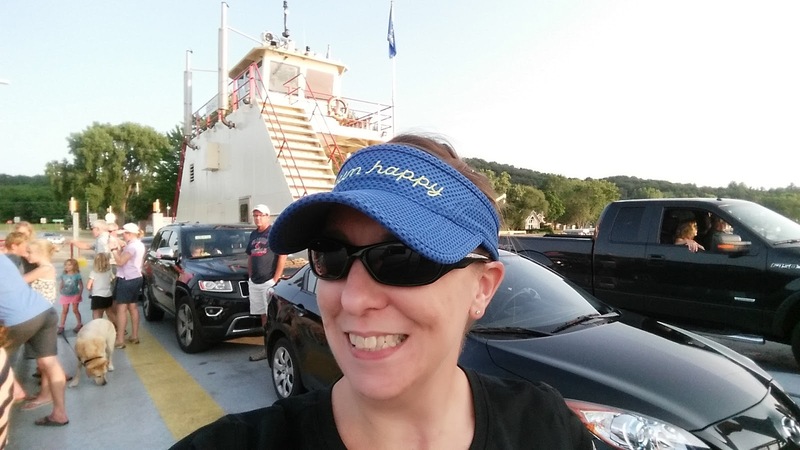 So there's been a little lapse in my blogging. Because I needed that two-month break, you're now getting a two month catch up on what I was reading during that non-blogging time. Get ready. In March I read six books for a total of 2,247 pages. That's an average of 72 pages a day. It brings my yearly total to 23 books and 8,220 pages. Add another nine books in April for a total of 3,024 pages. It's an average of 101 pages a day and that brings the yearly total to 32 books and 11,244 pages through the first quarter of the year. 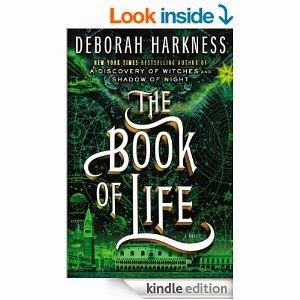 And now for the brief reviews, complete with number of stars given out on GoodReads. Follow me here if you’d like a more timely update on what I’m reading, what I think and what’s been added to my to-read list. These get thrown into one snippet because they're all part of the same Fool's Gold series. All quick, easy, boy-meets-girl type romances. Yes, they're a little predictable and a little cheesey, but I like them. 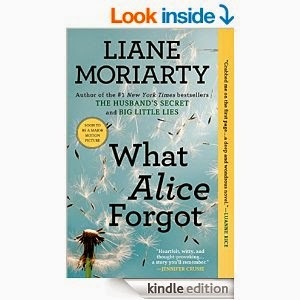 Not my favorite Liane Moriarty book. It was an interesting idea - woman falls at the gym and loses the last 10 years worth of memories - but the first half really dragged. Second half was more readable. Flat. Didn't care about the characters. Still wondering how this ended up on my "to read" list. Don't bother. This was a community read thing offered through my library. No waiting list for a book? Sign me up. It was an interesting read, seeing how prison inmates connected with Shakespeare, but it got a little long. 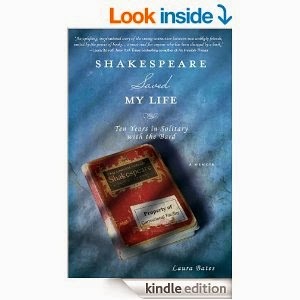 Made me want to revisit Shakespeare myself. Not bad. Nothing really stands out though. Seriously, the best book I've read this year. So different from any other World War II ear book I've read. It was a great story with characters who really came alive. Very hard to put this down. 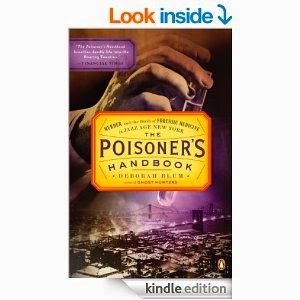 Go to your library or bookstore and get your hands on a copy of this book and start reading it now. Interesting read. I figured there was a twist, but wasn't quite expecting what that twist ended up being. I write for a living and I enjoy running long distances. So this should have been great. It wasn't. It had bright spots - moments when I went "YES!" - but more often than not I was annoyed with the writer's style and his tendency to repeat things over and over and over again. I think I need to give up on memoirs. I was disappointed. I've really liked other stuff by Gayle Forman (If I Stay and Where She Went), but this just wasn't as good. So that's what I spent two months reading. And of course, I have a stack of stuff just waiting to be taken off the pile and read this month. I need a job where I'm just paid to read. Too many books. What are you reading? Let's talk books and the month of February. It was cold - like the seventh coldest February since 1893 or something crazy like that - so I got a lot of pages read. I mean, when it's that freaking cold, I'd rather not venture outside. So I stayed inside and read. A lot. I finished nine books in that 28-day month of February. Nine books and 3,057 pages. In other words, an average of 109 pages a day. I told you it was cold. That means I've read 17 books and 5,973 pages so far during the first two months of 2015. Something tells me I should really revamp that 50 book goal I set for myself. I picked this one up because the author was one of my journalism professors at the University of Wisconsin. She taught my creative non-fiction class and I learned a ton from her. I liked this. It was informative, but didn't read like a piece of straight non-fiction, science writing. What's not to love about a story involving a pig and a spider? Loved it when I was a kid and I still love it as an adult. I just didn't like this. It was a hard story to get into and it never really grabbed my attention. Come to think of it, I don't think I liked the last book I read by this author. 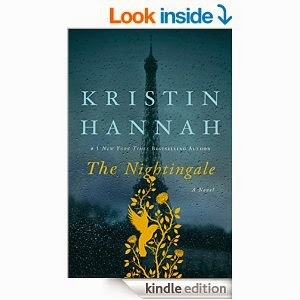 A quick, easy, chick lit kind of read. Cute story. Fast read. Probably my new go to series when I'm looking for an enjoyable, but mindless read. Doesn't hurt that the male lead character was a former pro cyclist. Sigh. I wanted to like this. I really did. I loved The Rosie Project, so I was hoping the follow up would be just as good. It wasn't. I couldn't get into this. I didn't care about the characters (even though they were the same characters from The Rosie Project). The middle was an absolute drag. The end was decent, but by that point, I just wanted to finish the book. Not a bad book, but a little slow to get into. 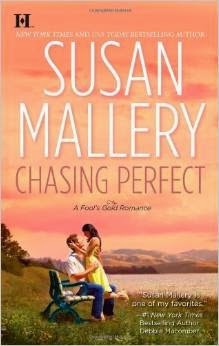 Apparently this is a second book in a series, but could be read as a stand alone. Maybe if I had read the first one it would have grabbed my attention quicker. Yup. I still like this series. I guess Dorothy Gale went back to Oz, got power hungry and now the people of Oz are revolting. And another girl from Kansas just happens to be brought to Oz via a tornado. She's supposed to help free Oz of Dorothy's wickedness. This was actually a pretty good read. I'm looking forward to the next book. After hitting triple digits in books read last year, I thought I told myself I was going to slow down on the reading. I finished eight books in January. Eight books and 2,916 pages. That means I read an average of 94 pages per day. Like I said, lots of reading. Seriously one of the best books I've read in a long time. 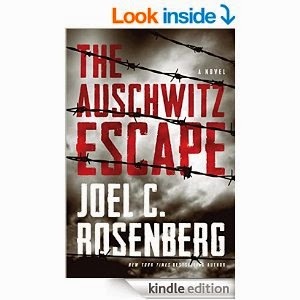 I've always been fascinated by the Holocaust, so I got sucked into this book, which tells the story of a man trapped in Auschwitz and his escape attempt. Hard to put this one down, even though I had to due to the nature of the story. This was a re-read. I watched the movie version of If I Stay and just had to read this one. By the way, the movie? Good. A bit of chick lit. It's the latest in a series that I enjoy. This one has been sitting on my to read pile since I finished the first two books in the trilogy in early December. Good final book to wrap up what I thought was a pretty fantastic series. Kind of cute. The story of how two people fall in love via tweets. Not sure I remember how this ended up on my to read list. Not quite the kind of John Grisham that I'm used to, but good. Not so much courtroom drama, but a good story wrapped around legal issues. I liked this. A legal thriller/who dunit with lots of twists and turns that kept you guessing. 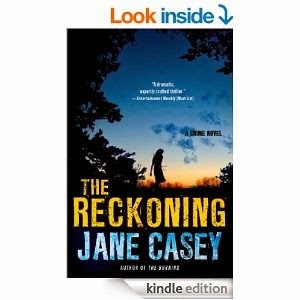 This author reminds me of Tana French's stuff, so if you liked In the Woods, The Likeness or other books in that Dublin Murder Squad series, definitely check out Jane Casey. Pretty sure this came from the GoodReads recommendations list. 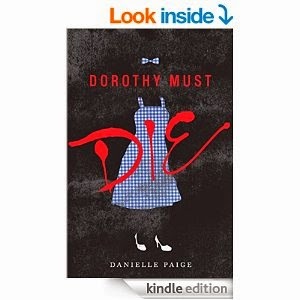 Quick, easy, enjoyable chick lit.